Superb South Coast On The Beach Villa, sleeps 8. Villa Benjamin. Property 12: Superb South Coast On The Beach Villa, sleeps 8. Villa Benjamin. Everything at this villa was perfect. It had everything you needed and more. 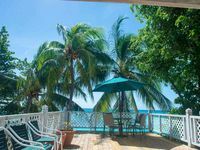 Villa Benjamin was a nice place to stay in Barbados. Location was great, back yard and decks were exceptional, and excess to the ocean was fantastic. Grocery store and gas station across the street were extremely handy. Food and restaurants were very high priced but we did find a Burger King in the mall and sure enjoyed some good fish and chicken sandwiches.